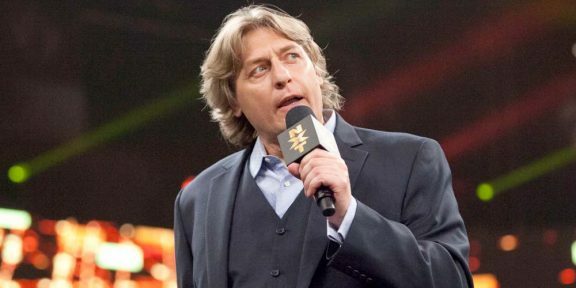 NXT coach William Regal will be holding two shows in the United Kingdom when NXT crosses the pond in a few days. William Regal: An Audience With A Wrestling Villain, a show presented by ErosComedy, will see Regal take center stage and demonstrates his diversity as a pure showman and old-school comedian, sharing more than 30 years of unforgettable personal stories and wild experiences both in and out of the squared circle. The first show will be on Wednesday, December 9, at The Westovian Theater in South Shields, Newcastle, while the second show will be ob Thursday, December 17, at The Forum in Nottingham. Tickets are being sold at skiddle.com with VIP tickets which include a meet & greet going for £40 while a regular ticket is selling for £20. NXT will be touring from December 10 to December 16, culminating with a live NXT Takeover: London show on the WWE Network. Regal’s shows will be just before and after the tour.